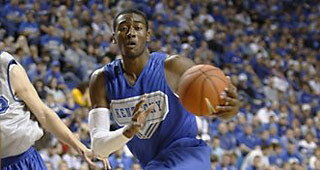 John Wall is widely considered the top overall prospect in this draft and is expected to be drafted No. 1 by the Washington Wizards. During Thursday's interview session, Wall talked a little about legacy, so I asked him if it is his goal to eventually be considered a top-10 or even a top-five point guard of all-time when his career is over. "That's the key," said Wall. "Growing up, I thought if you want to be a point guard, you want to be one of the top. You have guys like Magic Johnson and Isiah Thomas that played and you have guys like Deron Williams, Chris Paul and Derrick Rose who are the top point guards now. "It takes time studying the film and watching games and just working hard." I also asked Wall to describe his court vision, which I feel is the most extraordinary part of his game. "It's basically, you know you got to have (vision) the way LeBron sees guys. It's the vision, you have to have your head up at all times. "You have to read and react to the defense ahead of time. "There might be one play where I get a charge call , if i do the same play, I can tell what the defense is going to do and If your teammates moving into right position, you just have to deliver the ball to him."